Saturday, Oct. 1, 2011, Chehalis, Wash. The Bod Busters hosted not just a 1/2A Combat contest on Oct. 1, but the much revered Vintage Diesel Combat contest. The venue was Yardbirds in Chehalis, Wash., and if you missed this one, you missed a good one. The Yardbirds site has advantages for the Beavers and those from Oregon as it's not so far to drive. Other things that may seem to be trivial but are significant are the facilities ( rest rooms) and a grocery store that has a deli! 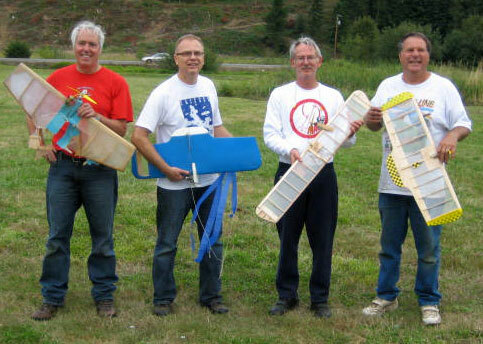 To this sector of model airplane flyers most Gypsy like (Combat fliers) this is about as good as it gets. The field was reasonably soft from the recent rains, but not swampy as it can be at times. The sky looked threatening, but turned out to be perfect for Combat, a light cloud cover and no sun in the eyes. Not cold and not hot, it looked like something even the stupid diesels would enjoy. As predicted, the trio some call the Butcher, Killer and Cheese arrived giving everyone an ominous stare. We of course didn't recognize it as such and gave them a warm welcome. This seemed to confuse the three and they scowled even more where upon, the Buzz Man asked if they were phone solicitors. Indignantly, they said no and were here to take no prisoners Buzz told them that Louie aka Mike Hazel was a prison guard and they should talk to him. Photo: "The Butcher" Barrie Hobkirk. All photo by Buzz Wilson. Folks, all I can say is the resulting combat was a Donny-Brook. They swung from North, they swung from South, finally the Combat Monster told them to knock it off and fly Combat. The Butcher was to fly Kenny-b. Kenny, however had mechanical difficulties due to stupidity and could not stay airborne, giving them all a false sense of security. The usual spectacular matches were flown by the Rein Man, The Buzz man , the Combat Monster and Lone Wolf Robert Smith. After several matches of excellent flying, Robert took the top honors by defeating the Rein man in a close match for first and second. Meanwhile, Killer had been cutting up the BBB with super aggressive moves that left the crowd slack-jawed. The Butcher, not to be outdone, was burning up the sky with moves no one else would consider and we were impressed. Who is this flyer and why is he called The Cheese? 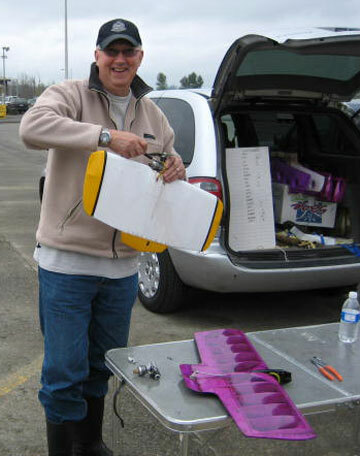 Photo: The Cheese Greg Davis prepares his Vintage Diesel Combat plane. cheese is just that, cheese. Much to our dismay, Cheese began flying combat with a skill rarely seen in this area. Unlike many locals, he didn't blindly fly into line balls or make un-thinking attacks on his opponent. No. The Cheese used that skill that you only see at the National level by the better fliers. While It may look less aggressive, on closer inspection, you see that if too large of a cut would be taken, the Cheese would pull back and take another pass so as to leave more streamer for the next cut, or skillfully avoid line balls and STILL get his cuts. The finals came down to the Rein Man, Lone Wolf Robert Smith, Killer and The Cheese. The Butcher was found talking to Kenny-b, saying that you'll be the next one. Kenny said he was the only one and smiled knowingly at The Butcher. The Rein Man and Robert flew an excellent match with several cuts and Robert winning it in the end. Killer and Cheese were yet to be flown for third and fourth and being teammates, they eyed each other suspiciously. Killer took the air first with Cheese right behind him. They circled each other menacingly while the smelly d-bats sputtered and spit at each other. Unprovoked, and quite without warning, the man they call Killer punched right through the Cheese's airplane leaving a shower of balsa wood and nylon in his wake. In fact, the airplane used by Cheese was so old; the BBB had to use carbon dating to determine if it was actually legal for the event. Killer Crozier somehow had emerged from this mess as the winner of third and The Big Cheese won fourth. Without a doubt one of the best matches of the day was the Rein Man and Killer. Jeff could do nothing wrong and Killer was just the opposite. All passes by both were excellent, Jeff's took cuts, while Killers didn't. To attend the last d-bat contest of the year. Thanks also to Dom McKay for the awards certificates, streamers, and Buzz Wilson for being contest director. For those of you who missed this one, I am sorry guys, you somehow missed the real fun contest that happens now and then. Some say it was The Butcher, possibly the Buzz Man, but we all know it was the Cheese. Winners of Vintage Diesel Combat, from left: Greg Davis, Kelly Crozier, Jeff Rein, Bob Smith. The final Combat contest of the season was held Saturday Oct. 1. The first event of the day was 1/2-A. At the Salem contest, a 30-second starting period was used with the match starting a four minutes. This worked well but did result in a refly because of a tie. We decided to go with a 45-second starting period, 4-minute match, ground time to be deducted, and a midair not ending the match. With five entries, everyone would fly each other. The first match of the day was Don McKay flying against Jeff Rein with Don winning with a kill. Don's next match was against Ken Burdick and ended with Don getting a Kill. In Don's third match, he flew Robert Smith and got a kill -- notice a trend. I flew Robert next and he got a kill on me. Next, I flew Jeff in what was the best match of the day. Jeff got two cuts on me, but I was able to get three cuts on him and then the kill. 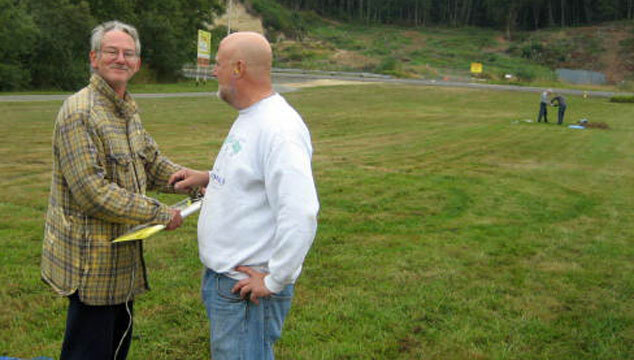 Next, I flew Ken Burdick who came into the circle talking trash. 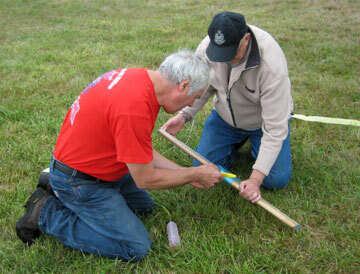 Shortly after the horn went off, I felt the twang of the string as it left Ken's plane and attached to my leading edge. Jeff then flew Robert with the match ending in a midair with both planes being unflyable; thus the only tie of the day under the new rules. Robert was not using a Sonic Chicken. Had he been using one chances are there would not have been a tie. Bob Smith studies an opponent's Sonic Chicken. Robert next flew Ken with Ken winning. Ken Burdick prepares for a combat match with Jeff Rein holding. The last match of the day would between Don and me. Don, who had been on a roll with three kills was looking to make me the fourth. This was not to be, on a pass my outboard wing was hit, and I went into the ground breaking the prop. After a prop change, the floppy wing was amputated. 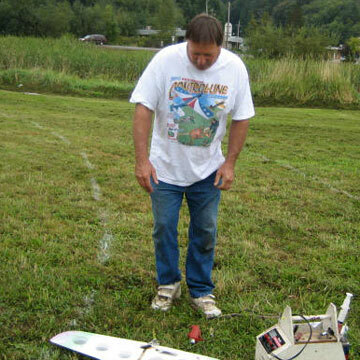 The plane flew amazing well missing half the wing; I had time to make one pass and missed. When I went inverted, the plane went on autopilot and into the ground. Don won the match on airtime. 5. Ken Burdick, Kent, Wash.